IMAGINE A NEW BUILDING that has the power to transform a neighborhood, to provide a safe place for people of all ages to congregate, to promote sustainable solutions, to serve as an example for civic engagement, and to spur economic development on its surrounding streets.Imagine that all of this happens without even stepping inside the building. This is exactly what Paul Murdoch Architects achieved in their project for L.A.’s Central Avenue Constituent Service Center (CACSC), highlighted in this month’s article “The Civic Heart of Central Avenue” on page 54.Conceived as a park with city buildings in it, CACSC is an 8,000 square foot public, municipal roof garden built by the City of Los Angeles.According to researchers at Michigan State University, building rooftops account for a staggering 21-26% of urban space in American cities. For some, this figure may simply bring to mind images of lonely pieces of mechanical equipment. For many others, rooftops are seen as underutilized space ready and waiting for design expertise to transform them into habitable environments. Green Roofs for Healthy Cities has researched the benefits of green roofing which range from public benefits such as waste diversion, storm-water management, and the moderation of urban heat island effect to private benefits that improve day-to-day operations of building owners and tenants (such as energy efficiency, fire retardation, improved air quality and reduction of noise and electromagnetic radiation).As more people become aware of the benefits of green roofing, the demand to incorporate them into projects steadily increases. Despite the name, green roofs still require a properly installed conventional roof system. Regardless of the type of waterproofing membrane type proposed for a green roof, the component parts remain largely the same. In the NRCA Vegetative Roof Systems Manual, now in its second edition, the National Roofing Contractors Association recommends all green roof systems include the same components to ensure a quality roof installation. • A root barrier layer, which protects the waterproofing membrane from being damaged by roots. • A protection layer is a perforation resistant mat that is designed to prevent damage of the root barrier and roof construction during the installation phase. • A drainage layer that allows excess water a clear path to move to the roof drains. This layer also functions as a water storage layer, aeration space for the system, and protection for the layers below. • A filter fabric layer to separate the plant and substrate layers from the drainage layers below. It ensures that small particles, humic, and organic material are kept out of the drainage layer and retained for as nutrients for the plants. 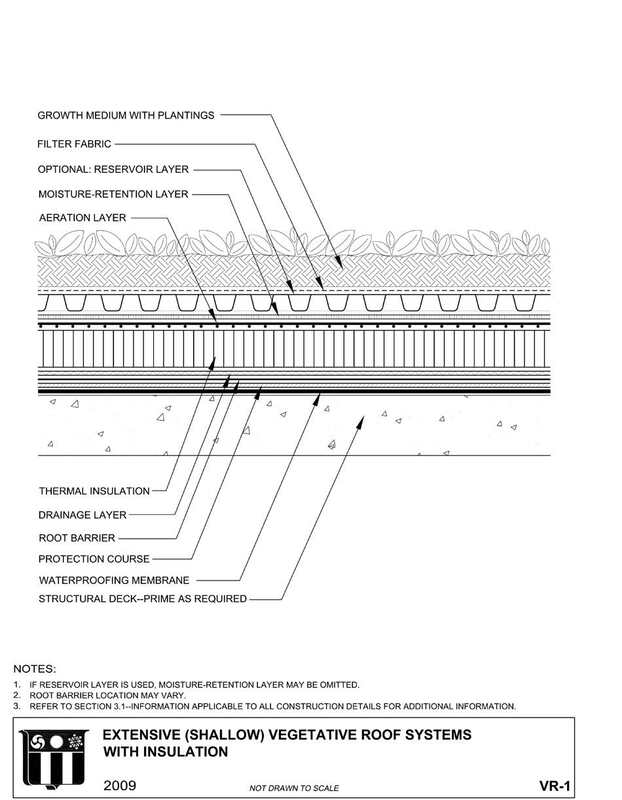 • An engineered growing medium supports the plant life of a green roof. It should be made of lightweight mineral material and have a high water retention capacity with good permeability. • Plantings selected for the appropriate climate zone of the project. Figure 1. Extensive (shallow) vegetative roof system with insulation. Figure 2. 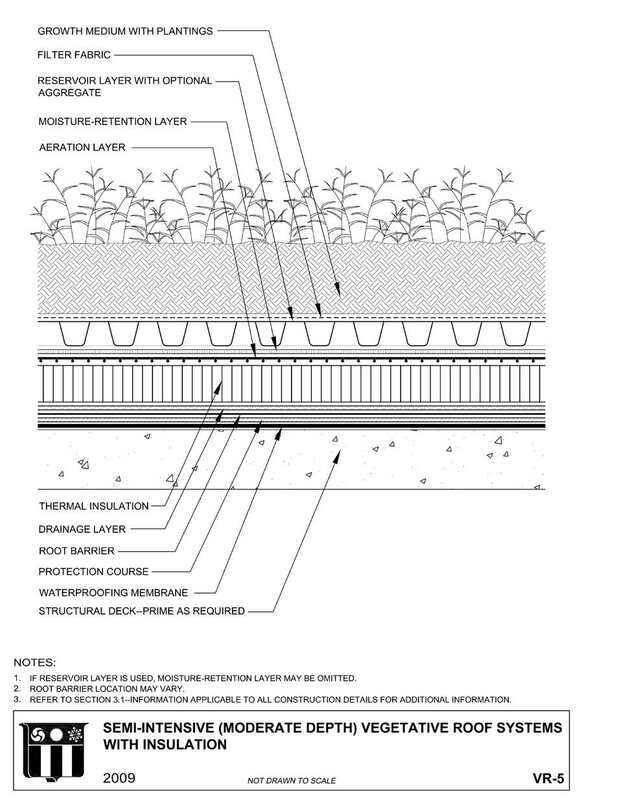 Semi-intensive (moderate depth) vegetative roof system with insulation. 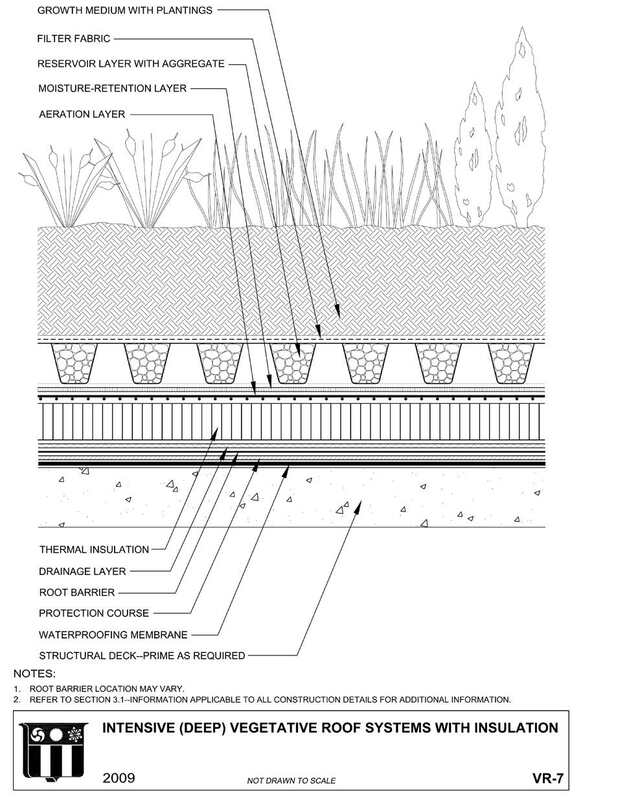 A valuable resource to professionals designing, specifying and installing green roof systems, the NRCA Vegetative Roof Systems Manual is a technical document intended to complement the NRCA Roofing Manual series. Divided into four main sections, the manual provides information on green roof project considerations, system guidelines, construction details, and a helpful glossary. Green roofs have traditionally been divided into two different categories: extensive and intensive systems. 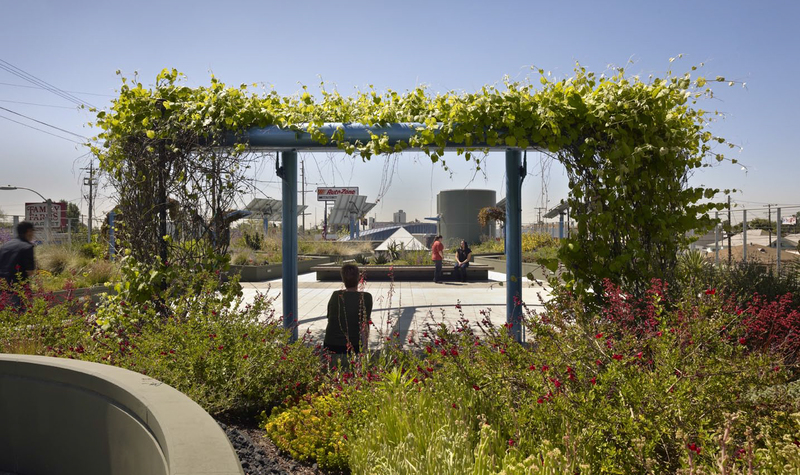 As green roof technology continues to develop, a third system, semi-intensive, has emerged. Extensive (shallow) green roofs typically contain an engineered soil-based growth medium ranging from 2 to 6 inches in depth. These systems are designed for smaller plant material, such as succulents and grasses that are not meant to support active human use. Extensive systems can be used on roof slopes up to 30 percent and greater (for typical detailing, see Figure 1). Semi-intensive (moderate depth) green roofs typically contain an engineered soil-based growth medium ranging from 6 to 10 inches in depth and can accommodate a greater diversity of plants. Typically used on roof slopes less than 30 percent, semi-intensive systems have a greater initial cost and require greater maintenance than extensive systems (for typical detailing, see Figure 2). Intensive (deep) systems can range from 6 inches in depth to several feet. These systems can accommodate the greatest amount of plant diversity as well as architectural features such as pools, gardens and structures. Although intensive systems provide the greatest range of design and biodiversity potential, these systems are associated with the highest initial and maintenance costs (for typical detailing, see Figure 3). When deciding whether a green roof is appropriate for a project, it is important to consider the positive benefits as well as the potential challenges associated with design and construction. Structurally, the dead load of the roof system can be impacted by a variety of factors such as contractor skill, the type of growing medium selected, and water retention in soil.Additionally, roof landscaping may change live loads resulting from publicly accessible spaces,snow drift patterns, and seismic loads. Feasibility studies should be performed on existing and historic structures to determine if the building has the capacity to carry the weight of a green roof. During the design phase of a project, the architect should consider several things that help reduce the risk of an improperly installed system. • All waterproofing details should be reviewed to anticipate any potential problem areasresulting from difficult geometries or complex interfaces. • Providing guidelines for the roof slope will ensure that the slope provides enough waterto plants while carrying any excess water to the drainage and retention system. • Minimize inaccessible penetrations. Plantings can make it difficult to access a large portion of the roof creating maintenance challenges if the waterproofing layer needs to be repaired. Locate any penetrations that must remain within maintenance corridors for future access. • Consider the height of flashings. Flashing must be high enough to accommodate all layers of the roofing system. • Protect all membranes and flashings from vegetation and root growth. Any root barriers used as protection must be compatible with the selected roof system. Root growth barriers may also impact the integrity of future electronic leak detection testing. • Consider the impact of wind uplift on your roof system. In vegetated roofs, ballast consists of growth media, the trays or containers holding the growth media, large stones, paver systems or lightweight interlocking pavers. • Impact of plant selection on fire resistance rating. Some plantings that retain high amounts of water or, a design that incorporates programmable irrigation controls with motion sensors to monitor and maintain moisture levels, can significantly reduce the risk of fire. Figure 3. Intensive (deep) vegetative roof system with insulation. Architects continue to push the envelope of what a green roof can be. These systems can accomodate the greatest amount of plant diversity as well as architectural features. Common construction pitfalls of inexperienced contractors include poorly-timed installation of filter fabric, drainage and growth medium layers, which causes them to miss the optimum window for planting. This can lead to schedule impacts, budget overruns and, in some cases, improperly installed systems. During construction, the architect should ensure the details are correctly implemented during construction and the design is executed as intended. Additionally, it is vital to test the waterproofing assembly to ensure watertightness prior to installing the vegetation and for some mission critical projects it may be prudent to install a permanent water testing system that allows for future in-service leak detection. The specific water testing method is dependent on the systems involved; however, flood testing, high voltage, and low voltage testing are among the most common. membrane if necessary, foam was installed before the soil medium was applied to reduce dead loads as well as the cost of the building structure, and drain extensions to the surface of the plantings provide access for periodic maintenance. to encourage their widespread installation. Cities such as Washington DC, Chicago, New York City and Portland see green roofs as a critical component of a healthy city with major environmental and economic advantages. And as the public continues to demand green roofs, architects continue to push the envelope on what a green roof can be. The Hills at Vallco, designed by a collaboration between Rafael Viñoly Architects and landscape architecture firm Olin, is currently the largest proposed green roof in the world. A vast 30-acre mixed-use development in Cupertino, California, this green roof would provide 3.8 miles of walking trails, meadows, vineyards, organic gardens and a nature reserve. Whether it’s roof as a public park, roof as garden, or roof as nature preserve, it is clear that creative projects leave us wanting more. 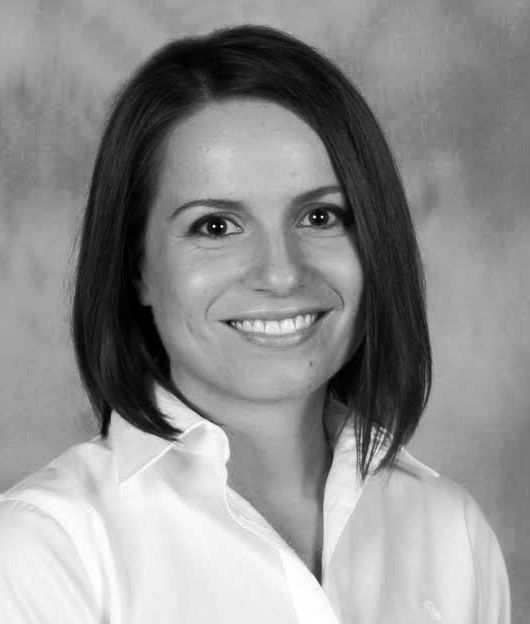 - “The Future of Green Roofs in the United States” Green Roof Research. Michigan State University, n.d. Web. 12 Nov. 2015. - Dessent, Thomas R., Kevin Bechtel, Michael Gaulin, and Michal Sasse. “The NRCA Vegetative Roof Systems Manual” 2nd ed.Rosemont: National Roofing Contractors Association, 2009, Print.